“Early this year, I realized that in order to research my Caldarelli family in Naples, I would have to hire a local Italian researcher because the Naples records are not available in the U.S. on microfilm like the Prata records are. I got very lucky and found Joe DeSimone, who was able to find the Naples records I needed. Joe was born and raised in New Jersey, but has lived most of his adult life here in Italy where he married and raised his children. One of his children, Giovanni, assists in his research and the other invaluable services he provides. “When I mentioned to Joe in an email that I was hoping to visit the Avellino area this year, he told me that he has an apartment that he rents. It was Joe’s apartment that we rented in Quadrelle. He also provides many other services – Giovanni picked us up at the airport and helped us get our rental car; took us to Prata for our first visit; and a week later, drove us to the Amalfi Coast after we returned the rental car. “There is no way we could have done this type of trip without Joe’s help. Most importantly, I hired him to research whether or not I still had any family in Italy and he found our Ferrara cousins, the most warm and welcoming family we could have imagined. “While trying to research my ancestors in Rionero Vulture, Italy, for many years, I could not find any records in that area using online searches. “I found an Italian website online, and posted the surnames I had from documents of my grandparents that also listed their parents’ names. A year or so later, Mr. DeSimone emailed me and said that he could do the research for me. “He gave me many names, addresses, phone numbers and emails of people who he had done research for, and I emailed all of them. Because of their raving responses, I decided to hire him. “He found lots of information for me in less than 2 weeks. I was very impressed with his promptness, and hired him a second time for even more information. “He even found living relatives for me ,which is a major plus, and that prompted me to go to Italy to meet them on September 4, 2012!! This will be a thrill of a lifetime for me to meet family that hasn’t been in touch or knew about one another for over 3 generations!!! “All the genealogy database websites in the world cannot hold a candle to the human touch. 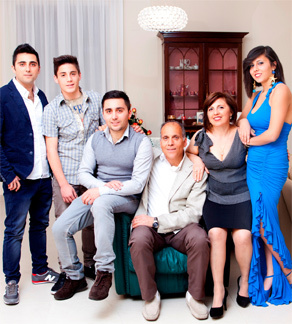 “Being a second-generation Italian American, I wanted to know more about my father’s ancestors, so I had been on a quest to find my paternal ancestors in Avellino in the Campania region of Italy through the use of ancestry.com and familysearch.org. Living in Arizona, I even had access to the Family Search library’s microfilm records in Mesa, AZ. All that and I still came up empty. “I had been recommended to Joe DeSimone by a researcher in another part of Italy. She said, ‘He is a great researcher.’ Talk about under-selling and over-performing!!! “I first met Joe through the internet about eleven years ago when I hired him for a genealogy project. I’d heard some of the horror stories about folks occasionally being taken by foreign researchers, but he seemed like such a nice guy that I decided to give him a try, and I have never once regretted that decision. “Over the years, my husband and I have made numerous trips to Italy, each time staying with Joe and his family. We refuse to stay anywhere else as we’ve become so attached. His entire family is just wonderful and I can’t say enough good things about them. They truly make you feel a part of the family and bend over backwards to make sure your stay is a pleasant one. “Firstly, I have to say that our reunion excelled all our expectations. We are now part of the most amazing loving family. My life and that of Douglas, Roderick and Andrew has taken on whole new meaning and I now could not imagine life without my Italian family. I am now able to converse in Italian with my family although I still struggle with the grammar but my dear family seem to understand me. Roderick, Andrew and Douglas integrated so well with the family too. Joe, I now feel a complete person as most of my characteristics are so similar to that of my family that I soon became part of them and it was just as if I had never been apart from them. The same has to be said of Roderick, Andrew and Douglas. Can you imagine us having a stepmother and aunt who love us. We miss them very much but are constantly in touch by telephone, email or Skype. “As you know, we spent two weeks in May with my family. Whilst there we stayed with four different families and became even closer during that time ( if that is possible). During our holiday we met more family members and friends. As you can imagine, many family gatherings took place. I cannot find words to describe my life now as it is so beautiful and I am constantly on a” high” and life has taken on a whole new meaning. I am sorry that you could not be with us in May but at that time you also had family staying with you. We are coming again to Italy from Wednesday October 6th to Wednesday October 24th and hope to see you and Palmira then. “Without you placing the last piece of the ‘jig-saw,’ all this beautiful experience would never have come about and I and my family will never be able to repay the debt we owe you, that of finding my family. Without you in November it would have been a major struggle as any Italian I had learnt went ‘out the window’ due to emotions; so communication would have been very difficult. Joe, you were amazing as you were constantly being asked to translate and nothing was ever to much trouble to you. Also, and probably most importantly, we needed you to make contact with my cousin in Villaricca as I think we would have come up against a ‘brick wall’ due to past family problems.